Break each graham cracker into 2 even pieces. Place one half of the graham cracker on a piece of foil. Place half a Hershey Bar or a Reese's Peanut Butter Cup (or both, I won't judge!) on top of the graham cracker. Place a marshmallow on top of the chocolate. 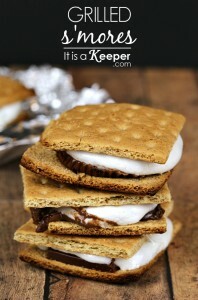 Wrap entire s'more in foil. Repeat process above for remaining s'mores. Grill over medium high heat for 5-7 minutes or until the marshmallow melts. Remove from foil packets before serving.